Stunning 13.5" hand blown bottle vase by Adriano Dalla Valentina, dated 2003. In excellent condition. 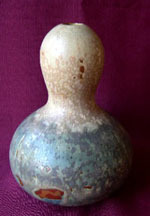 Rare unique 7" double gourd vase by Axel Salto, signed and dated 1935. This vase appears in Robin Hecht's book on Scandinavian pottery. Created in Salto's studio, this vase is in excellent condition. 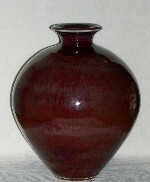 Wonderful 9" vase with beautiful oxblood reduction glaze by Berndt Friberg for Gustavsberg, with incised signature and dated 1974. In excellent condition with a well turned foot and neck. Large 13.5" vase by Charles Catteau commemorating the centenary of the Boch Freres factory, D2741 F914. Signed by Catteau and dated March 18, 1941. In excellent condition. Monumental 13.25" Boch Freres Keramis, Gres Keramis Catteau vase, D666, F971, 1920. In excellent condition. Fabulous 10" D 959, F901 signed by Charles Catteau for Boch Freres Keramis, 1924. In excellent condition. Monumental matte enamel 13.75" vase from Boch Freres Keramis, D1847, F951, 1934. In excellent condition with just a few glaze pops. We are unable to identify the initials of the designer. Stunning Boch Freres Keramis 9.5" by 12" jardiniere with peacock and floral decor, D1760, F242/3, 1933. In excellent condition.